– Man Booker Prize Winner Anne Enright at the launch of An Act of Love. The unforgettable story of how one woman fought to live – and die – on her own terms. 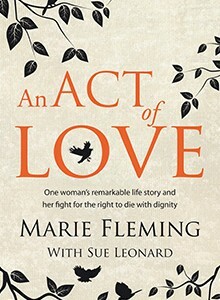 Marie Fleming became a household name in Ireland with her trail-blazing campaign for the right to die with dignity, when she took a landmark case against the Irish State to lift the ban on assisted suicide. But behind the Multiple Sclerosis sufferer’s brave fight lay a remarkable life story known to few. From her young years growing up in Donegal, as she struggled to keep her family together after her mother left, to her battle to keep her own baby – born when Marie was still a teenager – to her later quest for education and self-betterment against the odds, An Act of Love is an unforgettable story of ambition, of sorrow, and of life lived to the full. In it, she also describes coming to terms with MS and the ordeal of her later court case. 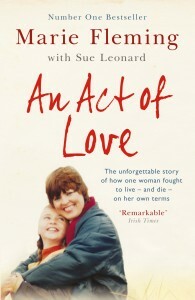 Completed just before Marie’s death in late 2013, most of all, this is a story of the power of abiding love. ‘Brave and touching.’ Sunday Business Post. ‘An Unflinching Account.’ Irish Mail on Sunday. Picked as one of the best memoirs of 2014 by The Sunday Times.